Identification: Page and Burr (1991); Etnier and Starnes (1993); Mettee et al. (1996). Native Range: Above the Fall Line in the Savannah, Chattahoochee, and Mobile Bay basins, of North Carolina, South Carolina, Georgia, Tennessee, and Alabama (Page and Burr 1991). Table 1. States with nonindigenous occurrences, the earliest and latest observations in each state, and the tally and names of HUCs with observations†. Names and dates are hyperlinked to their relevant specimen records. The list of references for all nonindigenous occurrences of Micropterus coosae are found here. Means of Introduction: Intentional stocking for sportfishing. Introduced into California between 1962 and 1964 (Moyle 1976a). Goodson (1966b) gave exact dates and numbers of fish introduced. Introduced into Kentucky around 1950 with stock obtained from Georgia (Burr and Warren 1986). Populations in the Hiwassee system in Tennessee are the result of introductions in 1943 (MacCrimmon and Robbins 1975; Etnier and Starnes 1993). Populations in the Cumberland Plateau were introduced in 1953 (MacCrimmon and Robbins 1975; Etnier and Starnes 1993). Status: Presumably extirpated in Arkansas (Robison and Buchanan 1988). In California, only the Sisquoc River introduction was successful (Moyle 1976a). This location was the only one in California to receive a sizeable number of stocked fish (Goodson 1966b). Established in Georgia (Dahlberg and Scott 1971a, 1971b; Page and Burr 1991), Kentucky (Burr and Warren 1986), and Tennessee (Etnier and Starnes 1993). Unknown in North Carolina. Impact of Introduction: Introduced predatory centrarchids are likely responsible for the decline of native ranid frogs in California and for the decline of California tiger salamander Ambystoma californiense populations (Hayes and Jennings 1986; Dill and Cordone 1997). The Redeye Bass was introduced into headwater streams in Tennessee in the 1950s for sportfishing. Smallmouth bass were native to these same streams farther downriver. 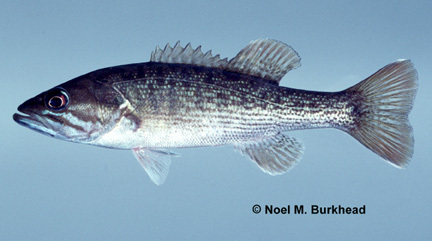 Eventually the Redeye Bass extended their range downriver and became sympatric with the smallmouth bass and hybridized (Turner 1989; Turner et al. 1991; Pipas 1996; Pipas and Bulow 1998). The Redeye Bass has been documented to hybridize with native smallmouth bass M. dolomieu in parts of Tennessee, including the Ocoee and Obed systems in the Tennessee drainage and Roaring Fork system in the Cumberland drainage (Turner 1989; Turner et al. 1991; Pipas 1996; Pipas and Bulow 1998). These hybrids are fertile and are also capable of backcrossing. Hybridization and backcrossing has occurred over several generations and resulted in altered genetics of the parental species. These introgressed individuals are phenotypically similar to the parental species but differ genetically (Turner et al. 1991; Pipas and Bulow 1998). It was recently determined that 67% of the Micropterus sampled in nine streams in Tennessee were electrophoretic hybrids; 31% sampled from 11 streams were meristic hybrids (Pipas 1996). Meristics of both parental species and the resulting hybrid are given in Turner et al. (1991). Remarks: Although Page and Burr (1991) reported M. coosae as introduced into the Altamaha, Dahlberg and Scott (1971a,1971b) and Etnier and Starnes (1993) reported it as native to that drainage. Redeye Bass were originally brought into California in 1953 as broodstock. However, none of these fish were released into the wild and none survived (Kimsey 1957). Although Menhinick (1991) list Redeye Bass as introduced into the Tennessee drainage in North Carolina, his map shows the collections are actually in the Tennessee portions of the drainage. MacCrimmon and Robbins (1975) showed a map depicting this species' native and introduced range. Dill, W.A., and A.J. Cordone. 1997. History and status of introduced fishes in California, 1871-1996. Fish Bulletin 178. California Department of Fish and Game, Sacramento, CA. http://content.cdlib.org/view?docId=kt8p30069f&brand=calisphere&doc.view=entire_text. Erdsman, D.S. 1984. Exotic fishes in Puerto Rice in Distribution,Biology, and Management of Exotic Fishes. John Hopkins. Pipas, J.C. 1996. Distribution of the redeye bass (Micropterus coosae) in Tennessee and its hybridization with smallmouth bass (Micropterus dolomieu). Unpublished M.S. thesis. Tennessee Technological University, Cookeville, TN. Pipas, J.C., and F.J. Bulow. 1998. Hybridization between redeye bass and smallmouth bass in Tennessee streams. Transactions of the American Fisheries Society 127(1):141-146. Shapovalov, L., A.J. Cordone, and W.A. Dill. 1981. A list of freshwater and anadromous fishes of California. California Fish and Game. 67(1): 4-38. Turner, J.M., Jr. 1989. Introgressive hybridization of redeye bass and smallmouth bass in a north-central Tennessee stream. Unpublished M.S. thesis. Tennessee Technological University, Cookeville, TN. Turner, J.M., F.J. Bulow, and C.J. O'Bara. 1991. Introgressive hybridization of redeye bass and smallmouth bass and its management implications. First International Smallmouth Bass Symposium 1991:143-150.